As one of America's most popular types of vehicles, the SUV has a host of immeasurable benefits. The expert associates at Ramsey Mazda are well equipped to answer any questions you have about how an SUV can provide for your family's needs. For growing families, there is no better choice of vehicle than an SUV. 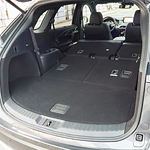 Not only can these types of vehicles hold a top number of passengers, but an SUV also boasts an exceptional amount of cargo space and hauling capacity. All of these factors combine to make an SUV a no-brainer when looking for a vehicle to accommodate a family of any size. The safety of an SUV is highlighted by the height the driver sits off of the road. From this commanding viewpoint, the driver has a birds-eye-view of the road in front and behind. This peace of mind is partnered with a host of active safety features.